The Hoodoo is late, but here it is! Contact Shihan for your questions, thoughts and whatever's for consideration into next month's Hoodoo. maintaining our web site. Without the knowledge of webmastering,, our site would eventually "die" or become old and stale. At that point it would just have to be taken down and "junked". Sometimes the learning of something new is mandatory if the continuance of, something initially unknown, is not done. You could always pay someone to research web site files and the mastering software, but that would make the project too costly to maintain. If the funds are limited and the project is worthwhile, then the wind element has to be activated for survival. Approximately 4 more classes and these three individuals should be able to perform most of the basic tasks required to keep the site up and running. Four to Five more classes , to whomever wishes to continue, a few well written notes and most of the site should be maintainable. A few classes after that, in "password protect" and "formmail, will allow complete continuance of our site. I'll work around everyone's schedules to make this happen, as it is one of the most important entity's in my martial arts career at this time. As you have learned in other terms, Never believe what is presented, until enough time has passed to prove the "fact"! 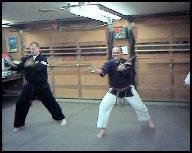 It doesn't matter whether you are in the traditional "kumite", "randori" or in a business or personal situation. When presented with verbal or written statements with reference to items that will or could affect you or your family, never put much credence in them. Let a good bit of time pass before, taking the statements "to the bank". Until time has proven the information as fact, treat what is said or written as just so much "hot air" until history proves otherwise. Putting faith in what is presented may lead you down the "wrong path" and deflect the direction of which you should have traveled. I just received a phone call from an individual who was old enough (77) to know the facts that he was presenting and humble enough to appreciate my side of a controversial letter. He appreciated the fact that I didn't appear to be the type of individual who would go along with the crowd, just because of the numbers. True martial artist are very private and independent individuals, and perform irregardless of the "apparent opponents strengths". Most individuals appear to be team players and require others around them who agree with their life style and/or philosophies . Individualist are just that. They go their own way, irregardless of the directions presented by others. We most generally will listen and politely accept that which is presented, but not depend on it for our final decision. If we did, then it would not be our decision, but the decision made for us by somebody else. Individualist perform from what they have learned as personal history and not from hypothetical hearsay. We may make a mistake and learn the hard way, but in that manner, we are not to make that mistake again. There is no better teacher than "up front and personal". In that way, we know for fact, that what we just witnessed was either a failure or a success. My suggestion about the successful change-up that went initially bad is: Force yourself to use "To move the shade" and "Forestall #2" right away and through the first 2 or 3 feeling out confrontations. If you are initially fairly hesitant, only use non-dedicated, full-depth, multiple movement techniques that end up centerline, with as much speed as you are capable. It won't be long before you have found the weakness that you need to "turn the tide". The past month, in our Aibudo strategy classes, we have been discussing a couple of strategies, one of which is the "change-up" strategy. It is known also by, "The Rat's Head and Ox's Neck. What if we use this strategy and it is so effective in breaking a dead-lock, that it increases your opponents spirit dramatically. So much that, in the beginning, you end up not quite sure of what their true plan is? What now? Think about this a bit and I'll give you my suggestion later in the Hoodoo. Making It "Over The Wall"
I'm sure everyone, in the beginnings of their martial arts career, have hit a "wall" when attempting one physical movement or another during the "Undo" portion of the class. You hit a certain area of reps and appear just unable to "make another one". Welcome to normality. Everyone's "wall" is different to some degree and overcoming it can be humiliating and/or embarrassing. The other night, Mr John maintained the jumping jack count right up to 400. This is well over the "wall" he hit in the beginning of his training. That initial "wall" was quite steep, as it is with everyone, but once conquered, improvement is quite substantial with much less effort.